View More In Kitchen Safety. 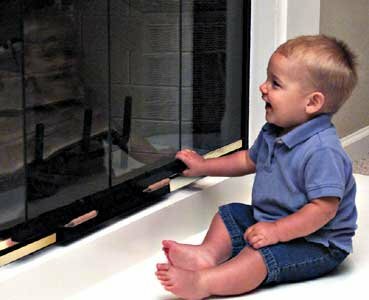 The Fireplace Door Lock helps prevent hands and fingers from getting pinched in fireplace doors. It mounts over the handles of swinging or folding doors to lock them in place. Fits fireplace doors with horizontal handles between 6" and 9" apart. Durable metal construction. Measures approximately 24"L x 2"H x 3/4"D. Simple installation with a Phillips Head Screwdriver. For Use On Fireplace Doors With Horizontal Handles Only. Requires a Screwdriver to be Installed or Removed. This Fireplace Lock Must be Removed in Order to Use Fireplace. Fireplace door handles must be between 6" and 9" apart. One bar is 24.5" long, the other is 14.25" long. If you have any questions about this product by Safety Innovations, contact us by completing and submitting the form below. If you are looking for a specif part number, please include it with your message.